Clearly Kelly's resignation is part of a wider Catholic conspiracy to destabilise the government. Not only is she herself famously a member of Opus Dei, a sinister cult whose inner workings were memorably exposed by Dan Brown a few years ago, but several other conspirators have papist affiliations also. There was Siobhain McDonagh, whose resignation the other week kicked off the latest round in the long miserable death of the Brown government. She's a Catholic. Her longstanding political friend David Cairns, who resigned a few days later, used to be a priest. Perhaps, secretly, he still is. Both are protegés of John Reid, Catholic chairman of that notorious hotbed of Fenianism in days gone by, Celtic football club. Reid is said by some to be weighing up whether he can topple Broon himself. Is it just a co-incidence that two other Catholic cabinet ministers with misgivings over the bill - Paul Murphy and Des Browne - are also rumoured to be for the chop? Well, is it? Remember, too, that behind all these papistical plotters (one of whom is even called Greg Pope) stands the eminense grise and lost leader Tony Blair. Every so often a hint is dropped that Tony is disappointed with Gordon's performance, or had predicted it; or he is seen deep in conspiratorial conversation with David Miliband; or some ancient memo is leaked in which Tony is revealed to have described Gordon as "vacuous". Was he receiving Instruction? Or instructions? One of the Prime Minister's first decisions last year was to shelve plans to repeal the 1701 Act of Settlement, which allows the heir to the throne to marry a member of any religion except Roman Catholicism. The noses of Scottish Catholics, in particular, have been twitching: they wonder whether, as the son of a Presbyterian minister, Mr Brown has been influenced by the ancient prejudices of his community. 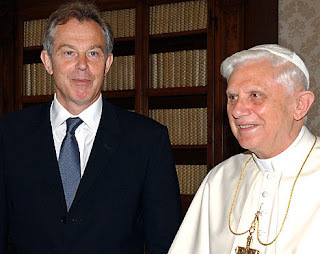 More than enough reason for a well-placed Catholic cabal in government to want to undermine Gordon Brown. Indeed, I wouldn't be surprised to learn that the Pope's dastardly plan goes further still. With Brown deposed and Labour humiliated in England and Scotland, can the final destruction of the United Kingdom be far behind? Will the British state, ancestral foe of popes since the 16th century, finally be toppled, the remnants to be enfolded within a new Catholic empire of Europe? Will the great work of Edmund Campion, Guy Fawkes, the Old and Young Pretenders, the Bourbons and the Bonapartes finally be achieved in this generation? I wrote this yesterday in a spirit of irony. Yet Damian Thompson has also noticed the strange timing of the plan to amend the Act of Settlement. He thinks it is a blatant attempt to buy Catholic votes - though he also notes that, fine though the plan sounds, a "fourth term Labour government" isn't going to be around to implement it. I'm convinced that Ms Kelly's conscience no longer allows her to serve in a government that attacks faith schools and forces Catholic adoption agencies to close. She may even have been given a nudge in this direction by Opus Dei. Titus Oates, you should be living at this hour. And the phrase 'cui bono' itself sounds phonetically remarkably like a cheerful greeting to a well-known Taigh rock singer with close connections to the Papacy. Coincidence? I don't think so.